A historical tourism is worth a thousand experiences. Many travelers agree to this statement. One of the best Banten’s historical sites is Oey Dji San’s House. It is located in Karawaci and it is part of Tangerang City. As the name suggests, this old structure was the reminiscence of a Chinese Captain named Oey Djie San. Some parts of the house had been taken apart by the local government, though. Today, visitors can only see the leftovers of the house. What makes it special, actually? The house emits a vintage aura and it has a mixed architecture style of Chinese and Europe. In terms of appearance, Oey Dji San’s House looks so old and fragile. No wonder, it has been there for decades. The most noticeable feature is the roof. It has a unique shape and size. No wonder, most of the tourists would like to capture some pictures of it. The house is surrounded by several bushes and trees. These create a comfortable nuance, especially for the guests. As mentioned before, most parts of the house had been demolished. It is the local’s government policy, after all. There was even a strong opposition from the locals regarding such plan back then. Travelers keep coming to this house for numerous reasons. For instance, they want to witness directly the uniqueness of the structure of the building. It is because the house combines different styles including the Chinese, Dutch, and Indonesian. That means the shape and design of the house are top-notch. There is no similar structure having the same characteristics as such house. The next uniqueness is the carvings. These are located on each side of the house. Therefore, don’t forget to take photos of those features. The roof of Oey Dji San’s House has the shape of swallow’s tail. Perhaps it is the most noticeable part of the house. For foreigners, such shape is definitely unique. Some guests will be astonished by it, for sure. What’s next? It is the history of the house. According to the locals, this house was a shelter for Chinese people. Actually, they were the victims of the conflict in 1946. Apart from that, there was Tangerang’s biggest rubber plantation located near to this house. The rumor has it. Oey Dji San’s House is older than Boen Tek Bio Temple. 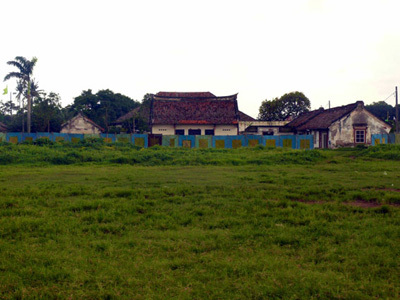 That means it is definitely an ancient structure in Tangerang City. Today, it becomes tourist lure for those who love history and unique structures. Unfortunately, the structure is not completed. Despite this weakness, you are able to learn some history and unique architecture of the building. Somehow, it becomes a suitable place for a family vacation. In order to reach Oey Dji San’s House, you must head to Tangerang City first. The distance is 32 km from Jakarta. Also, the trip takes 1 hour. The best route to reach the location is Pantura Street. Once you reach Tangerang, your next destination is Karawaci.